Logo design by Dominique Bayerdorffer. 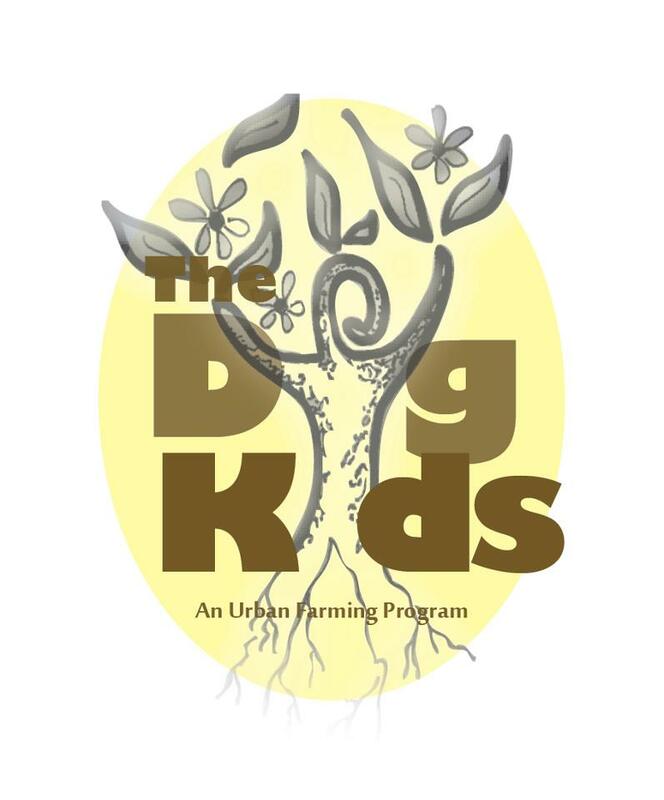 “The Dig Kids – an Urban Farming Program” is charged in working with Kingston youth to grow food, learn farming practices, encourage entrepreneurship, beautification, pride and good health through hands on farming experiences. Formerly a program of the Kingston Land Trust, THE DIG KIDS – AN URBAN FARMING PROGRAM is a new program of Kingston Cares (a program of Family of Woodstock) in partnership with Larrecca Music Management and Croswell Enterprises, Inc. with support from the City of Kingston and the City of Kingston’s Parks and Recreation Department, made possible by generous public support including a donation from Kevin McEvoy and Barbara Epstein. DONATE to “The Dig Kids – an Urban Farming Program”. Designate your donation to “The Dig Kids 2014”. Posted in Uncategorized	| Comments Off on Welcome! Introducing….The Dig Kids in 2014. We are pleased to introduce you to the Dig Kids in 2014! Here they are picking Blueberries a few weeks back. Congrats and have a great season. L/R: Natasha, Nataya, Adolfo, Ally, Siobhan. Bottom: Leanne Tory-Murphy, coordinator. Not present on this day was farmer Kaycee Wimbish. The Dig Kids Launch Program in 2014. Farm Stands Now Open! The Dig Kids kicked 2014 off in a big way by taking the reigns alongside Farmer Kaycee Wimbish to open a Farm Stand at the Kingston YMCA Farm Project located behind the YMCA off of Summer Street in Kingston. The farm stand offers organic produce grown in Midtown, Kingston and is open on Thursday’s at the YMCA from 4 -7 pm. The group will also run a ‘Mobile Market’ at locations throughout Midtown. The Dig Kids Show their Stuff at the Midtown Farmer’s Market. Donate Now for the 2014 Dig Kids Season! “The Dig Kids – an Urban Farming Program” had a great afternoon participating at the Kingston Midtown Farmer’s market. 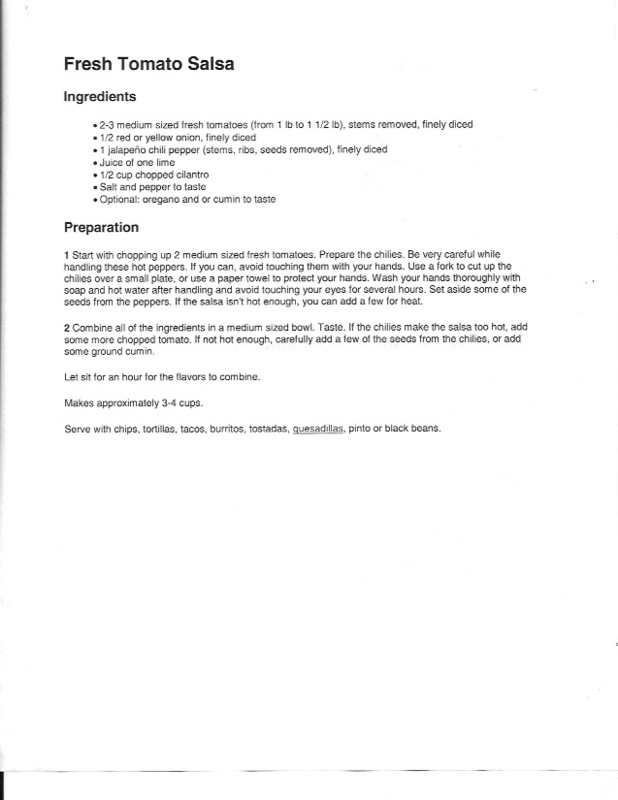 There, they presented four different salsas using vegetables from their gardens this year. 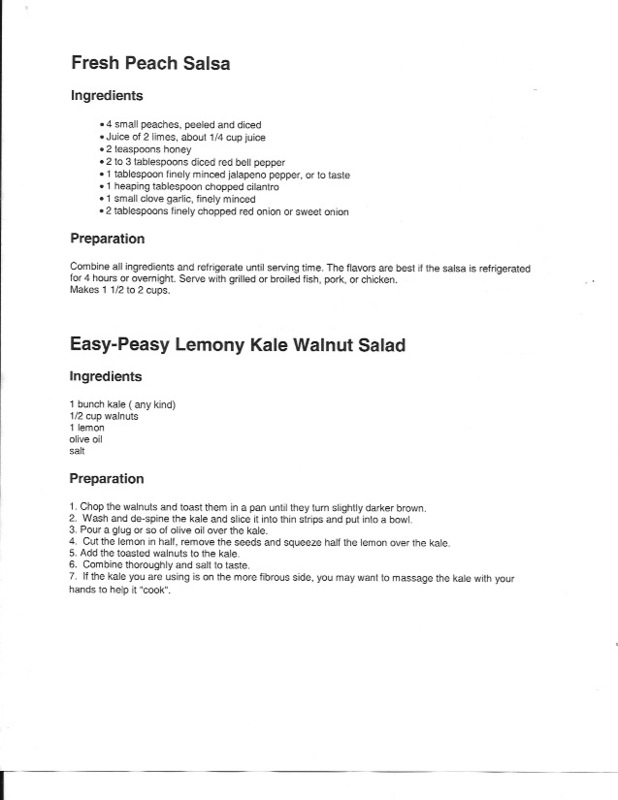 Some children had kale for the very first time today. Way to go Dig Kids! Please donate! Thanks to a generous donor, to raise funds for their 2014 season and beyond, every dollar up to $500.00 will be matched when you make a donation to the program now through September 30th, 2013. But that doesn’t mean we can’t keep accepting your donation. Please, give what you can to keep this important program alive and well in 2014. About Family of Woodstock – Since 1970, FAMILY has been an anchor for area residents- a place where people are respectful and caring, and where the search for solutions is creative and tireless. FAMILY’s shelters, emergency food pantries, court advocates, counseling and case management services, hotlines, and child care supports all work together to help people achieve the changes they seek. About Larrecca Music Management – Larrecca Music Management is a boutique music management agency located in the Hudson Valley. LMM is charged in providing support and strategy for our clients, paying close attention to their creative goals, musical endeavors and legacy. With a focus on education, community and healthy living our group is dedicated to developing programming that can inspire those young and old in their creative pursuits. The Dig Kids (an Urban Farming Program) 2013 End of Season Events. Donate now! Every Dollar Matched Up To $500! 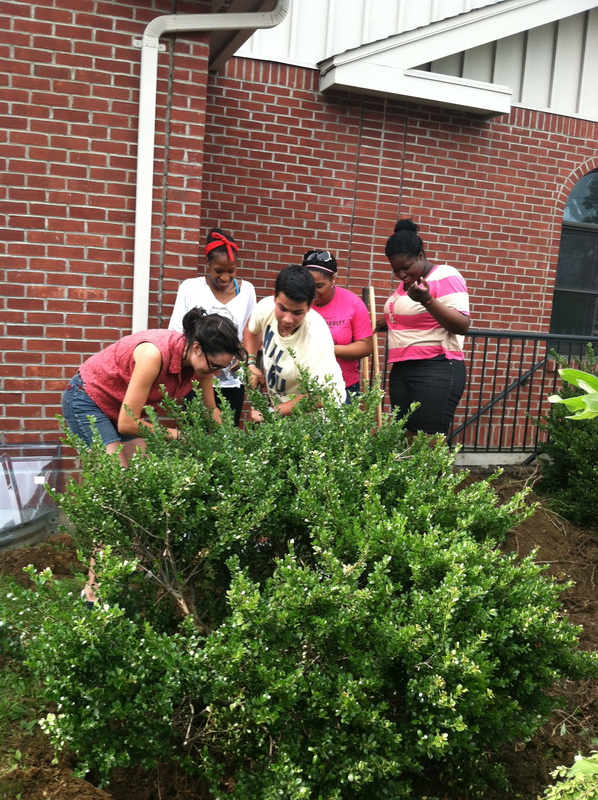 “The Dig Kids” putting in Apple Trees at the Everette Hodge Center in 2013. The Dig Kids, an Urban Farming Program of Kingston Cares, celebrate their garden successes in 2013 on Tuesday, September 3rd from 4:30 – 8:00pm. Citizens are invited to the Midtown Farmers Market located on the corner of Broadway and Henry Street next to UPAC to meet “The Dig Kids” and to sample salsa using ingredients from their garden projects. Donations can be made online now for the 2014 program year with every dollar matched throughSeptember 30th. 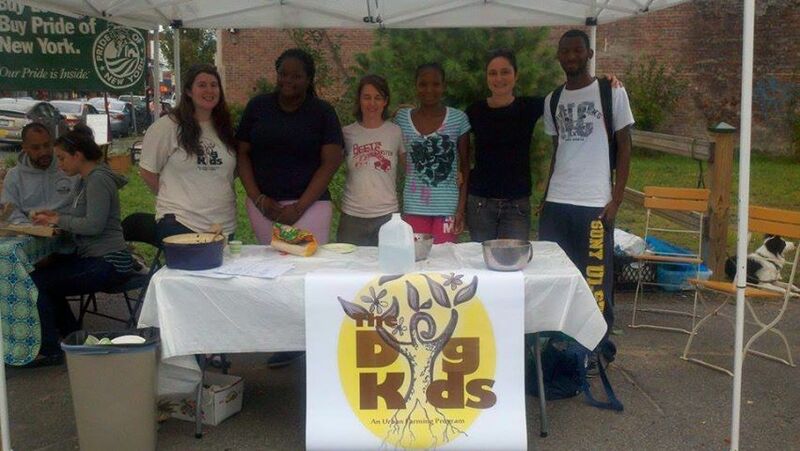 Kingston, NY – The Dig Kids, an Urban Farming Program invites the community to celebrate their garden successes in 2013. Since May, three Kingston youth between the ages of 14 – 21 have been paid to work weekly to work under the stewardship of first generation organic farmer Kaycee Wimbish of the South Pine Street City Farm and Leanne Tory-Murphy, an educator. Now in its third year, throughout the Dig Kids growing season, youth transform the front of the City of Kingston’s community center at the Everette Hodge Center and Van Buren Street Playground, a city of Kingston park, while learning valuable farming skills that include garden visioning, soil construction, companion planting, harvesting and preparing or donating their vegetables. The community is invited to meet the Dig Kids at the Midtown Farmers Market located at the corner of Broadway and Henry Street on Tuesday, September 3rd 2013 from 4:30 -8:00pm where they will make salsa using ingredients from their garden to sample and to discuss their experiences throughout the year. Thanks to a generous donor, to raise funds for their 2014 season and beyond, every dollar up to $500.00 will be matched when you make a donation to the program now through September 30th, 2013. But that doesn’t mean we can’t keep accepting your donation. Please, give what you can to keep this important program alive and well in 2014. The Dig Kids (an Urban Farming Program) Celebrate Garden Successes in 2013 on Tuesday, September 3rd. DONATE! Thanks to a generous donor, every dollar is matched through September 30th, 2013. The Dig Kids, an Urban Farming Program of Kingston Cares, celebrate their garden successes in 2013 on Tuesday, September 3rd 2013 from 4:30 – 8:00pm. Citizens are invited to the Midtown Farmers Market located on the corner of Broadway and Henry Street next to UPAC, to meet the 2013 Dig Kids and to sample salsa using ingredients from their garden projects. Donations can be made online now for the 2014 program year with every dollar matched through September 30th. Kingston – The Dig Kids, an Urban Farming Program of Kingston Cares (a program of Family of Woodstock), in partnership with Larrecca Music Management and Croswell Enterprises, Inc. with support from the City of Kingston and the City of Kingston’s Parks and Recreation Department and made possible by generous public support including a donation from Kevin McEvoy and Barbara Epstein invites the community to celebrate their garden successes in 2013. Through the Dig Kids program, youth continue to transform the front of the community center at the Everette Hodge Center andVan Buren Street Playground, a city of Kingston park, while learning valuable farming skills that include garden visioning, soil construction, companion planting, harvesting and preparing or donating their vegetables. Thanks to a generous donor, to raise funds for their 2014 season and beyond, every dollar will be matched when you make a donation to the program now through September 30th, 2013.